Meerkats, mammals native to Africa, rely on whatever sustenance they can eke out from their mostly barren habitats. Even when placed in captivity, such as a zoo, its diet remains similar to that of a wild meerkat. Their normal diet is mainly insects, but meerkats will consume other food when their survival depends on it. Insects make the bulk of the wild meerkat’s diet. 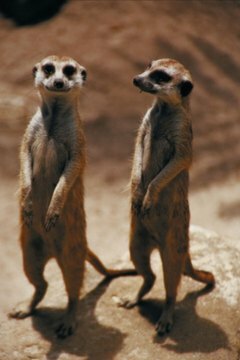 Common insects eaten by meerkats include termites, grubs and beetles. Meerkats also feast on small snakes. Snake eggs, when left unguarded, are also enjoyed by meerkats. Small, slow-moving birds are also prey for meerkats. They will also eat bird eggs if left unattended in the nest. Some meerkats dine on small rats and mice as a part of their regular diet. This is especially true in zoo environments. Scorpions are easy pickings for hungry meerkats. Because the scorpion’s venom does not affect meerkats, they can eat these arachnids without fear of serious injury, sickness or death. Meerkats often hunt centipedes and millipedes when looking for an easy meal to grab. Plants and leaves, although rare in the meerkat’s natural habitat, are also eaten. Plant roots, underground vegetables and fruits also account for a portion of the meerkat’s diet. Charlie's Project: What do Meerkats Eat?